Skiboarding Equipment: What Do I Need? Home > Skiboarding > Skiboarding Equipment: What Do I Need? If you are considering taking up skiboarding, there is a range of equipment and specialist clothing that you might require. This ranges from the skiboards themselves to insulated jackets and protective clothing. The good news, however, is that much of this equipment is ‘transferable’ between winter sports. So if you already have some skiing or snowboarding gear, the amount that you need to buy could be quite small. The skiboards themselves are perhaps the most obvious piece of equipment that you will need. The range of skiboards on offer is increasing all the time, meaning that what was previously a pretty simple choice has now become potentially quite confusing. There are a few main factors to take into account when choosing skiboards. Size is one of the most important of these. 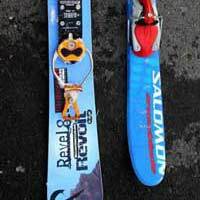 Shorter skiboards are generally favoured by those who want as much manoeuvrability as possible. Longer boards, on the other hand, offer more stability, particularly at high speeds. Your own size will also be an issue. If you are buying skiboards for the first time, you should go into a shop and have the boards fitted. Buying boards that are either too small or too big for you will have an impact on stability and speed, so it is important that you get the right fit. You have a choice of two binding types – non-release or full release. Non-release bindings are similar to those found on snowboards, while full release bindings are more like those seen on skis. Again, there are a few different factors to consider with bindings. Generally speaking, full release bindings are more popular on longer skiboards, as it is thought that they reduce the flexibility of shorter boards. At the same time, though, there is some evidence to suggest that the risk of injury is higher with non-release bindings, so you might want to factor this into your decision. The good news is that both binding types normally accept standard ski boots. So if you are already a skier or snowboarder and you have your own boots, you will probably be able to use these on your new skiboards. If you are new to winter sports, you will need to invest in some extra clothing. Obviously, temperature is a major factor here, and layers are important. Many skiboarders wear at least three layers on the slopes – a specially designed jacket, a fleece ‘mid layer’, and a thermal base layer. It is worth investing in a good quality jacket. As well as giving you the warmth that you will need, a specially designed ski or snowboarding jacket will provide you with flexibility and allow you to move easily – both of which are very important when you are travelling at high speed. You may also require a pair of salopettes – or, at the very least, a good pair of waterproof ski trousers. Remember that many of these items can be found second-hand at quite considerable discounts. By its very nature, skiboarding can be more dangerous than skiing. If you are travelling at high speeds, or if you intend to try some tricks, you should consider investing in some extra protection. Helmets are common amongst skiboarders, and they can significantly reduce the potential for injury. It is worth spending a bit of money on a good, specially designed helmet. It really could save your life, and they are available for less than £100. You might also consider wearing body armour. This sits under your clothing, and helps to protect your spine in the event of a crash. Again, the amount of protection you choose to wear is a personal decision, but investing in body armour can help you to avoid injury and can give you extra peace of mind. As with all winter sports, it is important that you get the right safety equipment. But it is worth noting that this doesn’t need to break the bank. All of the equipment listed here is available from second-hand outlets, and this can significantly reduce the total cost. Remember, though, that safety should never be secondary to price – so make sure that you read our tips on buying second-hand equipment.